Last night, Gabriel Sanz Gonzalez, the CEO of the low-profile offshore private financial institution, Zuma Bank, incorporated in the Commonwealth of Dominica, arrived in-country, on board the Venezuelan business jet YV-2961, which is a Learjet Type 55. 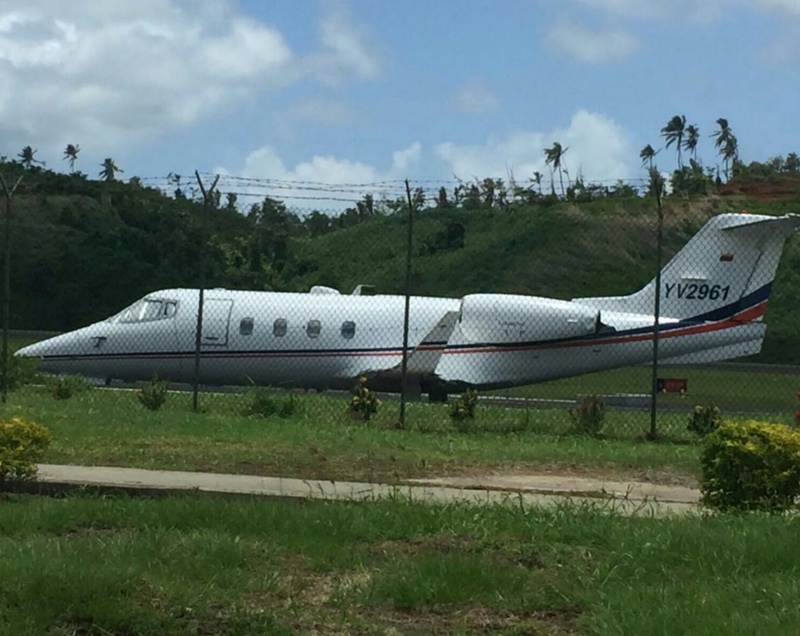 The aircraft reportedly came in directly from the British Virgin Islands, the corporate formation jurisdiction of choice for anyone who wants to obtain a corporation with beneficial ownership information that is be totally and permanently opaque. Sr. Sanz came to Roseau to see Claudius Lestrade, the director of Dominica's Financial Services Unit, which is part of the Ministry of Finance. We are not aware of the subject of his visit. 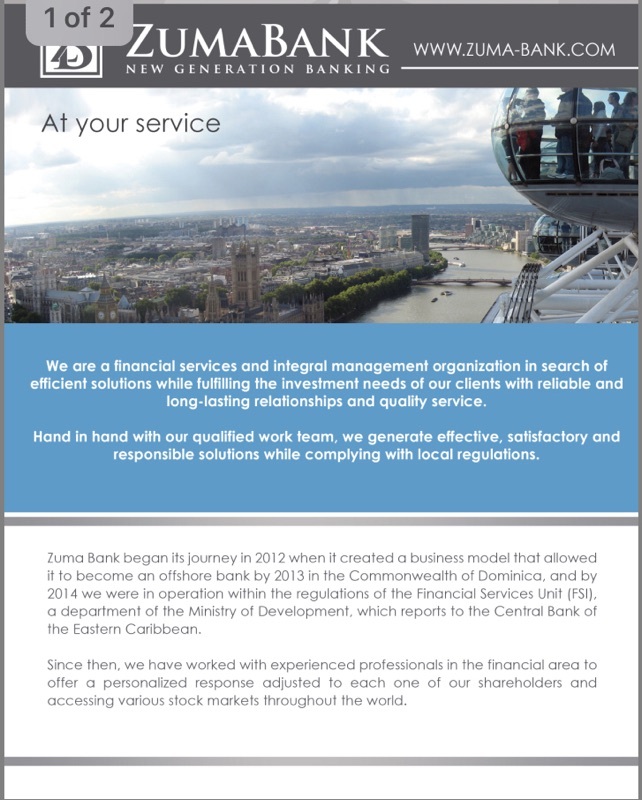 Since its Dominica incorporation in 2012 according to Zuma (though the FSU states it was in 2015), there has been no significant information in the media, detailing Zuma Bank's operations or clientele. 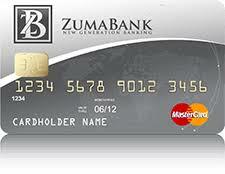 Zuma Bank has no footprint in the global financial industry, though it holds itself out to be a private bank. Many of the Internet websites are in the Russian language, and it is therefore assumed that the bank's marketing is directed towards wealthy Russian nationals. 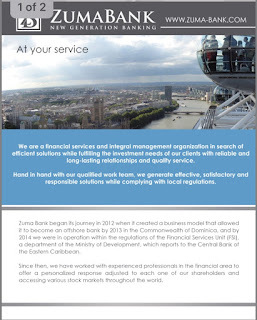 What is in Zuma Bank's book of business and who are its clients ? 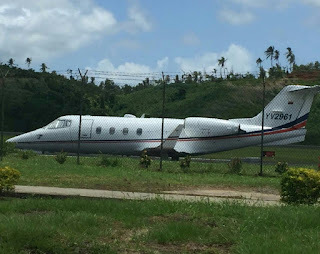 The arrival of Sanz is not the only recent arrrival of private aircraft that has puzzled Dominicans; on another recent evening, Melville Hall Airport staff were dismissed at the end of the day's aviation operations, notwithstanding information about a late arrival. One member of the airport staff, having seen all the runway and airport lighting extinguished for the night, was driving by the field later that evening when he saw, to his amazement, that all the lights were back on, meaning that a significant arrival was in progress. What's with all this frenzied activity involving Venezuela of late ? We note that the so-called Bolivarian Republic is now funding hurricane reconstruction, specifically single-family home construction, but given Venezuela's failing economy, is there another reason for this totally unexpected financing ? Remember also that the US has recently sanctioned Venezuelan officials, which might expose local contractors and vendors in Dominica to OFAC violations. 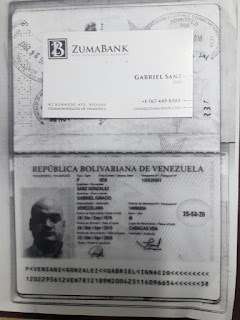 Finally, is Zuma Bank owned by Venezuelan or Russian interests, and who are its clients ? We cannot say, but our inquiry into the bank's operations shall continue.